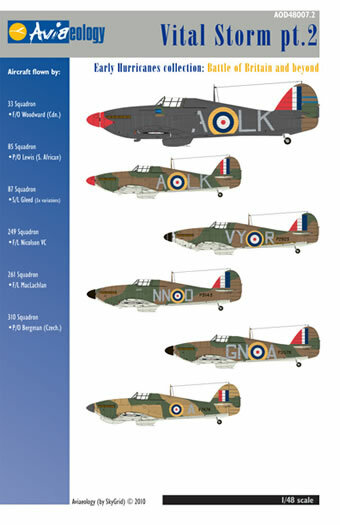 Aviaeology has just announced new 1/72nd, 1/48th and 1/24th scale, silk-screen printed decals suited for the Hurricane Mk.1. Hurricane I P3395 as JX-B of 1 Squadron (F/L Clowes). Hurricane I N2359 as YB-J of 17 Squadron (P/O Stevens). Hurricane I P3854 as VY-Q of 85 Squadron (S/L Townsend). Hurricane I P3119 as VY-X of 85 Squadron (pilot not known). Hurricane I P2961 as LE-A of 242 Squadron (F/O McKnight). Hurricane I N2381 as LE-X of 242 Squadron (pilot not known). Hurricane I (Trop) P3731 as “J” of 261 Squadron (Sgt. Robertson). Hurricane I L1926 (fabric wing?) as DU-J of 312 Squadron (P/O Vasatko). Hurricane I (Trop) P3729 of 33 Squadron (F/O Woodward). Hurricane I P2923 as VY-R of 85 Squadron (P/O Lewis). Hurricane I P2798 as LK-A of 87 Squadron (F/L Gleed, later S/L Gleed). 3 variations, including a nightfighter, of this aircraft’s paint and markings are explored. Hurricane I P3576 as GN-A of 249 Squadron (F/L Nicolson VC). 2 possible paint and markings variations are provided for. Hurricane I (Trop) V7474 as “A” of 261 Squadron (F/L MacLachlan). Hurricane I P3143 as NN-D of 312 Squadron (P/O Bergman, F/L Sinclair, Sgt. Furst and others). Due to the size of the markings, 1/24th scale subjects are more limited in nature. Hurricane 1 P2961 as LE-A of 242 Squadron (F/O McKnight.). Hurricane 1 N2381 as LE-X of 242 Squadron (pilot not known). Hurricane 1 (Trop) P3731 as “J” of 261 Squadron (Sgt. Robertson). Hurricane 1 P2798 as LK-A of 87 Squadron ( F/L Gleed, later S/L I. Gleed). Hurricane 1 P3576 as GN-A of 249 Squadron (F/L Nicholson VC). 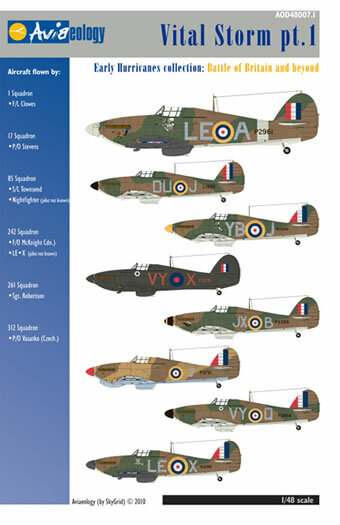 Modelers are provided with three different schemes for S/L I. Gleeds aircraft. The two sets of optional markings for F/L Nicolson are speculative, but still nice to finally be available for this historically significant aircraft. The promotional data attached to this announcement details the material for the 1/48th scale release. The smaller 1/72nd scale item is identical with 1/24th scale being further limited. Only 200 sheets will be released in the smaller scales with 1/24th scale further limited to a run of 100 sheets. The instruction sheets are quite extensive providing full painting and markings details for each aircraft. Alternative shades of red are also provided for the national insignia. Unfortunately, markings out of the box for the 1/24th scale Trumpeter Mk 1 kit are completely inaccurate and virtually un-useable to any modeler looking for accuracy in their projects. The Airfix kit has decals that are most certainly beginning to age. Consequently, I am sure the larger scale decals will be quite popular.